Somewhere in the parish of Speen is the site of the Roman town of Spinis, meaning 'Thorny Place,' from which the later name is obviously derived. It is the only Roman town in Berkshire whose Latin name is known. Tradition says it was positioned somewhere near Woodspeen Farm, though Foley Farm may remember Roman ruins used as a kind of folly. It was only a small settlement, but it certainly held an Imperial Posting Station or inn, where Imperial messengers on government business were able to refresh themselves overnight. It stood on Ermin(e) Street, the Roman Road that passed through west Berkshire between Calleva (Silchester) to Corinium (Cirencester). The parish of Speen includes a number of villages including Speenhamland, Stockcross, Marsh Benham, Woodspeen and Bagnor. Bagnor Manor came into the hands of the Dean and Chapter of Westminster in return for lands in St James' Park. The house is 17th century, including a sturdy staircase, but was refronted by Thomas Harrison in the early 18th century when he rented it from them. It has since lost its upper storey. Bagnor and its mill are mentioned in the Domesday Book (1086). The mill is still there, dating from the late 18th century, but it does not produce flour, fulled cloth or paper any more. It was turned into a theatre in 1965. Speen village itself is a Saxon hilltop settlement that developed alongside the road between Thatcham and Hungerford, long before Newbury was ever thought of. The parish church was built in the valley below. 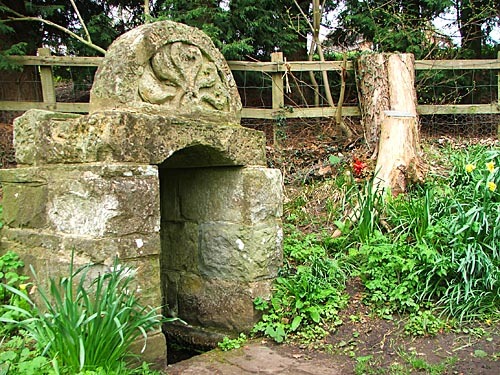 By the side of a little path between the two stands the Lady Well (see photograph above), the best of Berkshire's remaining medieval holy wells. It is dedicated to the Virgin Mary, perhaps replacing an original Iron Age association with a Celtic mother goddess. It has a charming stone cover and the water can apparently cure eye complaints, measles and even rickets! As well as local devotees, it may possibly have attracted pilgrims travelling between St. Swithun's Shrine at Winchester and St. Frideswide's at Oxford. The medieval nave and chancel of the parish church remain, well hidden, in the north aisle beneath an almost total rebuilding of 1860 when the south aisle became the new nave. Shocking old photographs exist of the wanton destruction in the name of modernisation. However, the new building is attractive and the setting idyllic, especially when the sheep are grazing in the churchyard. Luckily, many interesting old monuments were reset inside: notably Jean Baptiste Castillion (1597), a Gentlemen of the Privy Chamber from Piedmont; his daughter-inlaw, Lady Elizabeth Castillion (1603); and the Margrave of Anspach (1806), all of whom lived at Benham Park. Benham Park is at Marsh Benham. It is the most magnificent classical house, built by Henry Holland in 1774/5 for the 6th Baron Craven. After their home at Hamstead Marshall Park burnt down in 1718, instead of rebuilding there, his Lordship chose Benham instead. They had many alternative houses, but liked the hunting in West Berkshire. It was later the home of the Margrave of Anspach and his wife. The house was modified by Sir Richard Sutton 5th baronet in 1891 and he built the Stockcross estate village, with pretty cottages along the main road, at the same time. Once offices, the mansion house has now been transformed into a home once more. Speen was at the centre of the Second Battle of Newbury in October 1644. Prince Maurice held the area for his uncle, King Charles I, but the Earl of Manchester arrived at Clay Hill and a fight became inevitable. William Waller (and Oliver Cromwell) were sent to outflank the Royalists in the west. They took two days to march north around Donnington Castle, but the the tactic paid off. The cavaliers were soon pushed back from what had previously appeared to be an impregnable position on Speen Hill. They ascended into the village, but Waller’s men were much hampered by the field enclosures in the surrounding area and the Royalists were eventually able to escape north to Oxford. On the Corner of Speen Lane is a stone memorial commemorating the battle. This doesn’t seem to have prevented people from stopping there. It was also at this inn, in 1830, that a large crowd of mounted locals gathered in order to join with still more mustered by the 3rd Earl of Craven at Gravel Hill near Stockcross. They then marched on a large number of farm labourers rioting in Kintbury as part of the famous 'Swing Riots' against agricultural mechanisation. © Nash Ford Publishing 2015. All Rights Reserved.